The Icefields Parkway (Highway 93N) from Banff to Jasper is a four-hour drive. We took four days, and still didn’t have enough time. My tiny island home doesn’t have mountains, so it’s strange how I’m attracted to them. I spent my early working-adult years dreaming of visiting someplace with snow-capped mountains, saving up for a long road trip while building my stamina as one of the world’s fastest walkers. So when an unbelievable $500 roundtrip fare from Hong Kong to Vancouver popped up on Secret Flying, I knew I had to make this dream come true with a Canadian Rockies road trip. The Icefields Parkway – Highway 93N in the province of Alberta – is known as one of the most scenic drives in the world. The road carves its way through the majestic Canadian Rockies, promising not just breathtaking views but also plenty of hiking, history, and wildlife. Although this stretch of road between the towns of Banff and Jasper is only a four-hour drive, you could spend 3-7 days here and still find plenty to do. If you’re planning a self-drive trip as I did, here’s a guide with my Canadian Rockies itinerary, tips, and recommendations, all based on my own experiences. You can also get my Canadian Rockies map with all itinerary details. I was apprehensive about driving on the other side of the road (Singapore drives on the left). Furthermore, I’ve never driven a campervan. Renting a campervan is not cheap; based on my calculations, it cost as much as renting a car + staying in fixed-roof accommodation. Most campgrounds in the Canadian Rockies were fully reserved when I checked 6-8 weeks beforehand, especially since it was high season in June and there was free entry to all national parks in 2017 to celebrate Canada 150. I decided to give myself as little stress as possible, especially since this was my first long trip with a partner who also happened to not drive. However, if you’re an experienced roadtripper, you’ll probably prefer a campervan or RV! One of the first concerns I had when planning this Canadian Rockies road trip was: do I need a SUV or will a normal sedan be enough? Good news: a sedan is enough if you’re driving the Icefields Parkway in the warmer months (June to mid October). However, from November to April, snow tires are required and you may prefer an SUV. The roads are paved and well-maintained, and while most of the highway is dual-lane, the stretch between Banff and Lake Louise is a four-lane divided highway. However, take it easy when driving along smaller roads if you don’t want gravel flying onto your car or scraping the undercarriage. Shop around a lot on aggregators like RentalCars and Skyscanner, but also get direct quotes. I got the best deal directly with Avis by using discount codes found online. Pick up your vehicle downtown if possible. This will save you from outrageous airport surcharges. Look at the screenshots below: pickup from Calgary Airport makes the rental cost 1.5 times as expensive as pickup from a downtown location! Most non-US residents don’t have the rental car insurance that comes with US-issued credit cards. Instead of buying the rental company’s overpriced Collison/Loss Damage Waiver (e.g. Avis’s LDW is C$ 30/day), you can get comprehensive rental car insurance from RentalCover or Worldwide Insure for much less (approx. C$ 11/day). Due to the high demand, I recommend you book accommodation 8 weeks in advance. Check for best availability across a few weeks before finalizing your road trip dates. Private rooms in hostels are best booked directly. Sites like Hostelworld and Booking.com are cumbersome to search by date, and will show a hostel as “available” even though only dorms are left. I’ve linked directly to hostel websites throughout this guide as they let you check private room availability for an entire week or month. Check hostels’ private room availability directly. If you look at my Icefields Parkway map below, you’ll notice that I drove a rather uncommon route: one-way from Edmonton to Calgary. This was because our plans included visiting family and friends in Edmonton, touring a trapline outside Edmonton, and flying out of Calgary to our next stop, Seattle. You won’t miss much on the mostly flat road from Edmonton to Jasper. You get to enjoy the different northbound and southbound views. You have a second chance if you encounter bad weather or miss animal sightings. You can avoid additional one-way fees for your rental car, though Avis did not charge any one-way fees for my rental. I drove from Jasper to Banff over 4 days (+1 rest day in Banff), but you can easily double this itinerary and drive both ways over a more relaxing 7 days. After a few hours of flat driving on the Yellowhead Highway, watching the mountains rise up to embrace us felt magical. Our Canadian Rockies road trip was officially beginning! It’s likely you won’t enter Jasper National Park this way, though. 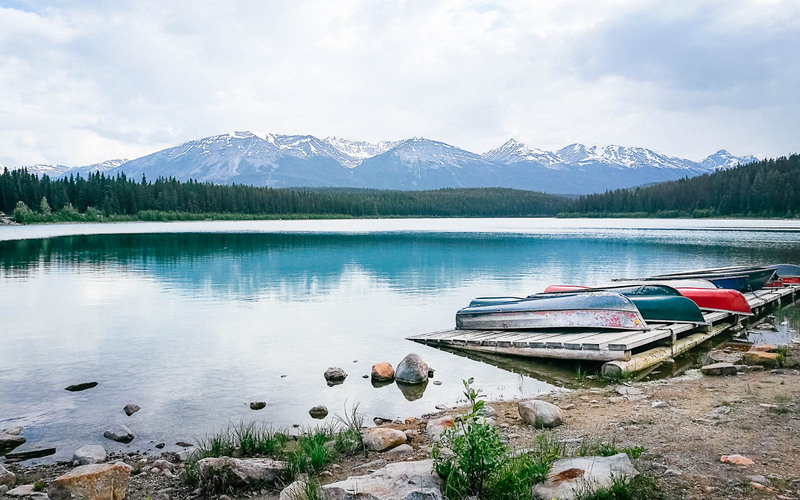 Jasper’s top highlights include Pyramid Island on Pyramid Lake; you’ll also pass by Patricia Lake, which I found to be the perfect spot to enjoy a long summer evening. Also, I strongly recommend signing up for a wildlife spotting tour in the evening, especially if you want to find bears. I thought I’d surely come across some animals while driving but believe it or not, I spotted zero bears, moose or elk throughout our road trip. Don’t regret it like I did! Many visitors to the Canadian Rockies say Jasper feels more like a real town than Banff, which is prettier but more tourist-oriented. We managed to get a private room at Jasper Downtown Hostel, which is one of the most comfortable hostels I’ve stayed at. Our morning was spent savoring freshly baked pastries at Bear’s Paw Bakery (plus takeaways for the road), before driving up to Maligne Canyon. With a drop of up to 50m in some places, this karst canyon is the deepest in the Canadian Rockies and makes for a lovely 2- to 3-hour hike. If you have time, drive on to Medicine Lake and Maligne Lake for more mountain views. However, note that you will have to drive back to Jasper in order to continue south on the Icefields Parkway. From Jasper, you have the option to take the scenic route: Highway 93A is a quieter drive that also provides access to Mount Edith Cavell. This is one of the most prominent peaks in the Canadian Rockies, with hiking trails offering views of the north face, Angel Glacier, and Cavell Glacier. Sadly, Cavell Road had yet to open when we visited. Note: check the Parks Canada website for road closures and permit requirements. In 2017, visitors had to obtain a free permit from the Jasper Park Information Center to visit Mount Edith Cavell. Highway 93A meets the main Icefields Parkway again at Athabasca Falls, so we stopped to take a look – and I’m glad we did. Photos don’t quite do justice to the thundering falls, so full of pure energy compared to the many placid lakes of the Canadian Rockies. Finally, we went for one the most popular tours in the Canadian Rockies: visiting Athabasca Glacier, which I felt was well worth the price. Read about our Columbia Icefield tour experience for more details. From here, it’s a straight drive down to Lake Louise, where HI Lake Louise Alpine Centre was our choice for private rooms on a budget. I would have stayed an extra night near the Columbia Icefield to make this day less rushed. If we’d gone up Mount Edith Cavell, we would’ve had to skip Athabasca Falls – and may have missed our Columbia Icefield tour too. Adding an extra day would also allow us to visit beautiful Peyto Lake and Bow Lake. This was the most tiring day for me even though there wasn’t much driving. After breakfast and a stroll around the Lake Louise Visitor Centre – well worth a visit to learn about the pioneers who opened up the Canadian Rockies – we drove to Lake Louise and spent around 3 hours hiking up to Lake Agnes Teahouse. It’s worth braving the crowds for the scenery! Of course, no Canadian Rockies road trip would be complete without visiting its most iconic, most-Instagrammed spot: Moraine Lake, down in the Valley of the Ten Peaks. Despite the cloudy skies and intermittent cold drizzle, I insisted on climbing the Moraine Lake Rockpile. Cold and exhausted, I just stood there letting the view soak into memory, accompanied by a friendly squirrel. By the time we descended, I was more than ready to check in to our deluxe Jacuzzi room in Banff. Accommodation in Banff is notoriously limited and pricey – my preferred hostel was fully booked – so check availability well in advance or bed down in Canmore, just 20 minutes away. After all that intense driving, hiking, and sightseeing, a good rest was in order. We slept in, did our laundry, strolled around Banff to find hidden thrift shops, and visited the Buffalo Nations Luxton Museum: a small but invaluable resource for learning a slice of Canada’s First Nations history. Banff is, without a doubt, a pretty mountain town. However, be prepared to encounter dozens of gift shops and big-name retailers. If you have some time and energy, go enjoy more views with these scenic day hikes near Banff. I, however, refueled with some local grub at Barpa Bill’s Souvlaki – known for their salty gooey poutine and hearty bison burger! We would be ending our Canadian Rockies road trip with a night in Calgary, so we took our time with breakfast at Rocky Mountain Bagel Co in Canmore before heading to Grassi Lakes. Tip: If you’d like to challenge yourself or save some time, drive all the way to the dam at Whitemans Pond and cut down via the steep, rocky Riders of Rohan trail. With its twin emerald lakes surrounded by cliffs and rock climbers, this cozy little spot marked the perfect end to our adventures in the Canadian Rockies. Our total Canadian Rockies road trip costs for two travelers came out to C$2032/person. Below is a breakdown of the costs for your reference, but note that we traveled comfortably; this trip can be done for much less if you’re on a tight budget. We bought a total of 67 liters that got us from Edmonton + two extra days of driving. This should be plenty for a round trip Canadian Rockies drive. Accommodation took up the largest percentage of our budget, mainly because we chose private hostel rooms as well as an expensive hotel in Banff after our initial booking at a guesthouse was canceled at the last minute. A campervan will cost about C$260-$300/night, while campgrounds average C$30/night + fees. Therefore, either car or campervan will cost roughly the same. We went for only one paid tour to the Columbia Icefield (C$114.45/person after tax). The Buffalo Nations Luxton Museum entry fee was C$10. We didn’t stick to a tight budget for meals. In fact, we treated ourselves to good breakfasts and dinners at restaurants, while packing trail mix and snacks for hikes. However, neither of us drink so we never had to spend on alcohol. Drive a campervan and camp at campsites. This flexibility is key for photography, since you can wait out bad weather or stay on at a beautiful spot to get the best shots. Allow more time for day hikes and pack more food, especially if there’s only one driver or you’re traveling solo. Go on more tours: wildlife spotting, horseback riding, kayaking, history and culture. Allocate many more days to this beautiful region and include Kananaskis Country as well. I was moved by mountains in my first encounter with the Canadian Rockies; this road trip confirmed that my love for the wilderness and great outdoors was not just a pretty fantasy to escape from city life – it’s real. What else would you like to know, or what advice do you have to share, about doing a Canadian Rockies road trip? Those views on your road-trip, wow! Same as you, I imagined doing a road-trip on a campervan and that wish hasn’t come true yet. I never liked mountains much before, but have since grown to love them more in recent years. Perhaps it’s because there’re no mountains in SG and hence they’re even more special to us? Great guide and tips you have here for people planning to go. Hmm, I don’t know, I’ve always loved nature. I’ll probably book a campervan for my next road trip now that I’ve tried driving on the other side of the road! Loved this. driving this route is on my list for a few years now. When I accomplished my personal mission to visit all seven continents this will probably one of the things I will do afterward. Awesome tips! Thanks for that! This is a trip we are planning for 2020 so is perfect timing as we celebrate our 30th anniversary and we will be taking our camper – either shipping over from UK or buying one in US. Can’t wait having seen your pictures. Thank you. Wow – shipping a camper over? Sounds incredible. I hope you have an unforgettable trip! Great article! It’s really, really informative. I’m also inspired to visit the Rockies now.